Today is the 100th birthday of an original, often imitated, never duplicated, the one and only Edith Bouvier Beale. By now, everyone has seen the documentary, the musical, the movie, everyone knows her story, and still she remains a truth and guiding light to every misfit I know. She is one of the most interesting people of the 20th century and definitely one of the most culturally significant. Watch the documentary soon, it is available on Hulu and other places and remember what it is like to not worry about what others think of you and what it is like to let yourself be it’s truest pure form. Authentic. The world was a better place because she was in it and still feels the loss since she has left it. BEST KNOWN FOR: Edith Bouvier was an American socialite and a first cousin of Jacqueline Kennedy Onassis. She is best known as a subject of the documentary film Grey Gardens. Performer, documentary film subject. Born Edith Bouvier Beale on November 17, 1917, in New York City, as the eldest of Phelan and Edith Ewing Beale’s three children. A first cousin to Jacqueline (Bouvier) Kennedy Onassis, “Little Edie”, as she was known, knew only affluence. The Bouviers earned their fortunes on Wall Street and in law, paving the way for a lifestyle that allowed Little Edie and her two brothers to have a childhood that bounced between Manhattan and the Hamptons. In the early 1920s, Edie’s father moved the family into a new summer home called Grey Gardens, a spectacular 28-room mansion with water views. Like her mother, a creative type who harbored dreams of becoming a singer, Edie Beale had artistic yearnings. At the age of nine a poem of hers was published in a local New York magazine, spawning a desire to become a writer. Yet her real love, despite her father’s deep objections, was for the stage—something that was almost certainly fueled by her relationship with her mother. Blonde, blue-eyed, and tall, Edie Beale was a beauty, “surpassing even the dark charm of Jacqueline,” recalled her cousin, John H. Davis. In 1934, the same year she attended Miss Porter’s finishing school in Farmington, Connecticut, Edie Beale modeled for Macy’s. Two years later, her debutante party in New York City was covered by The New York Times. 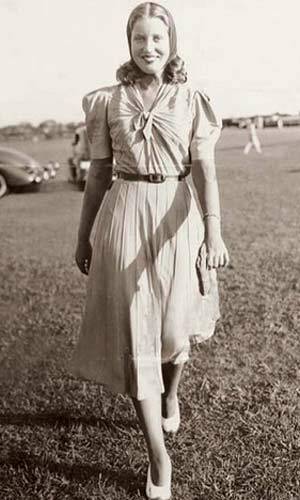 She participated in fashion shows in East Hampton, too, and by her early 20s Edie Beale had earned the nickname, “Body Beautiful.” She dated Howard Hughes, and reportedly turned down marriage proposals from John Kennedy’s oldest brother, Joe Jr., and millionaire J. Paul Getty. The limelight, though, would have to wait. By the mid 1930s, Phelan Beale had left Edie’s mother for a younger woman. The couple’s eventual divorce gave Big Edie Grey Gardens, some child support, and not much else. To keep the household going, Edie Ewing Beale leaned on her father for financial assistance and sold family heirlooms. On her own, without a husband to try and drag her to the Hampton cocktail parties she had no interest in attending in the first place, Big Edie’s singing aspirations only strengthened. She frequented clubs, and even recorded a few songs. In 1942 she showed up late to her son’s wedding, dressed as an opera singer. Her father, “Major” John Vernou Bouvier, Jr. was appalled and soon cut her out of his will. Without the money to support her or her house, Edie Ewing Beal’s life at Grey Gardens fell into disrepair. In 1952, at Big Edie’s calling, Little Edie returned home from New York City to take care of her mom. She wouldn’t leave again until Big Edie’s death in 1977. Big Edie and Little Edie railed against the threats, calling the visit by County officials a “raid” and the product of “a mean, nasty Republican town.” “We’re artists against the bureaucrats,” Edie Beale said. “Mother’s French operetta. I dance, I write poetry, I sketch. But that doesn’t mean we’re crazy.” Eventually, Jacqueline Kennedy Onassis stepped in with her checkbook, paying $25,000 to have the place cleaned up—on the condition that her aunt and cousin could remain in their home. Edie Beale’s style was also a popular part of the film, in particular the improvised head wraps—towels, shirts, and scarves—she used to constantly adorn her head. The coverings weren’t designed for style, but as a way to conceal hair loss from the alopecia she contracted in her early 20s. The effect, though, was a look that earned adulation. Calvin Klein reportedly claimed Little Edie’s look influenced some of his designs, and in 1997 Harper’s Bazaar produced a photo spread that was inspired by Edie Beale’s clothing creations. In 1979 Edie Beale sold Grey Gardens to Washington Post editors Ben Bradlee and Sally Quinn for a little more than $220,000 and a promise from the couple to restore it. Eventually, Little Edie relocated to Florida, where she rented an apartment in Bal Harbour. She died there on January 14, 2002. She was 84. 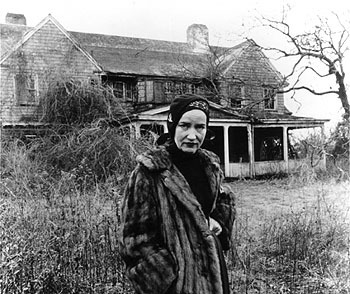 Grey Gardens and the life that Edie Beale and her mother led there, has continued to endure. In recent years a crop of new material about the women has been produced, including a 2006 DVD release of “The Beales of Grey Gardens” featuring more than 90 minutes of cut material from the original Maysles brothers documentary. In addition, Edie Beal and her mother’s life together inspired a Broadway musical that earned three 2007 Tony awards, as well as a 2009 HBO production starring Drew Barrymore as Little Edie and Jessica Lange as Big Edie. In the end, the 1975 documentary, which in 2003 Entertainment Weekly ranked as one of the top 50 cult films of all time, gave Edie Beale and her mother the kind of fame they’d always longed for. It’s very difficult to keep the line between the past and the present.